My brother Harry called me yesterday morning from his car on the way to St. Petersburg for the Everglades Challenge. We hadn't really spoken much lately, but that's normal. He said he'd been really busy at work and hadn't had time to get ready. He piled everything in the car planning to sort it into the proper bags when he got there. Then he stopped at Trader Joe's and bought a lot of trail mix. David Byrne immediately started singing in my head, "he's living off nuts and berries." I'm almost sure that's a Talking Heads lyric from Animals, but for years I used to sing to myself "I love the clouds!" when I saw a pretty sky believing it was from a U2 song, but when I tried to find it -- 3:08 into Electric Co. from Under a Blood Red Sky -- I realized he's really singing "I love the crowds." Really not the same thing at all. I got this picture when he arrived at Fort DeSoto Park for inspection and the Captain's Meeting. He called me after and said it was a very long meeting. He still wasn't ready. He didn't have time to take many pictures on the beach. This morning the race started at 7:00. I got the SPOT update that said Harry was on the beach. But then nothing happened. About 8:00 I got a call that he was being leisurely, he would leave in about 20 minutes. When the SPOT started updating it looked like this. By the time he turned around at waypoint9 I'd already read Mistermoon's report on the forum that Tampa Bay was "washing machine." 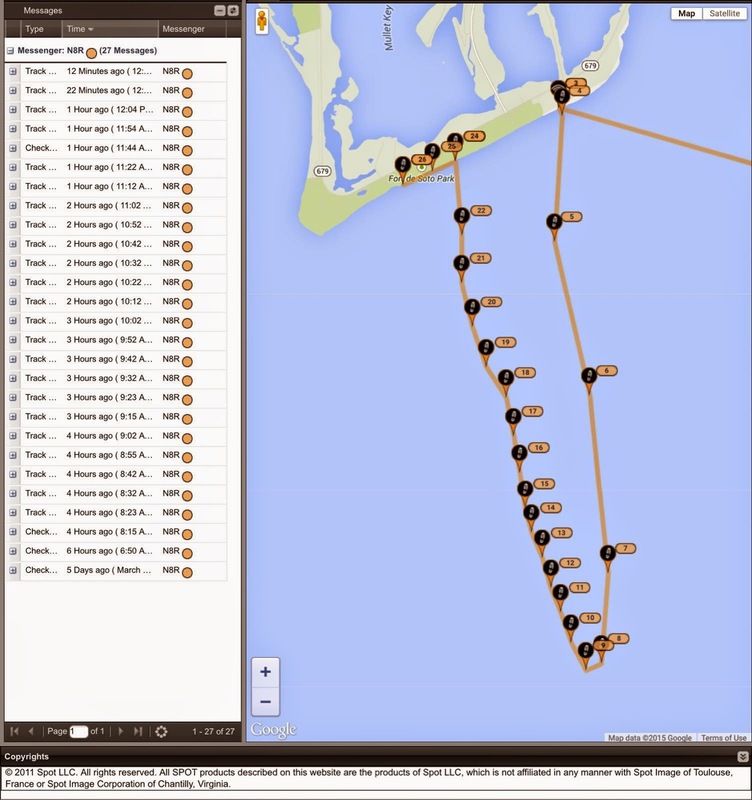 According to VHF radio the Coast Guard had to rescue a catamaran, a sailboat, and a kayak. I figured something broke on N8R or Harry just said, "To hell with this! I'm going home!" I also judged by the reported conditions and his rather deliberate path back to shore that he was not under sail. I didn't expect him to be able to use the phone as he clearly had his hands full of paddle. It didn't occur to me to be worried that his life was in danger. I guess that's what makes me a good shore contact. I was tense enough wondering what broke and how hard it must be to paddle in such a miserable chop. When he was to about waypoint 21 above I got a phone call from Race Control telling me to inform my challenger to get off the water instanter. The Coast Guard announced a mandatory weather hold. The Everglades Challenge was cancelled. Pending Chief talking them out of it. I told him, "Going by the SPOT track JibeTurkey has already turned around and is heading back to the start. He should be there in just a minute. I'll tell him the news." Then I started looking for information on the Coast Guard tizzy. The weather reports looked benign. But that's because it's hard to get weather for boats on the Wunderground app. I saw that the sky was pretty clear, the temperature about 19°C, wind about 22 km/h. Which is sort of a lot. But they don't put the sea height in the forecast. I found the actual Coast Guard announcement. They'd already rescued 11 people and their resources were stretched thin. They were going to terminate the event at the first checkpoint. "There has (sic) been reports of people with various stages of hyperthermia (sic) and the weather on scene continues to deteriorate to 4-foot seas and 20-knot winds." About that time I got the OK message from Harry's SPOT transmitter. He was on shore. I texted him the news about the cancellation. Then he sent me these pictures. Ouch. Poor rudder. He just made that too. When I talked to Harry on the phone I read him the Coast Guard statement. He said, "The only person out there with hyperthermia is probably me, paddling back against the wind. They must mean hypothermia." Yeah, I think they do. "It isn't cold today," he said, "But there may have been some people who weren't dressed properly. Eleven rescues is bad. Chief is going to be livid that those people got into a situation they couldn't handle." He wondered if he should drive back to Jupiter, get his old rudder, and come back. He figured even if the Coast Guard "cancelled" the event they couldn't stop people from sailing around with their friends. Last I heard he was making plans. If he turns the SPOT transmitter back on I guess I'll keep tracking him! Otherwise, the Everglades Challenge is over.